In today’s post, I want to share some of the valuable lessons I learned from Wes Linden during the 2015 MLM Mastermind Event in Orlando, Florida. These are notes that I took during his speech and they are not quotes. Each lesson is in bold and italics. After each lesson I share my own two cents. They are listed in no particular order. Enjoy. What you say and how you say it has a big impact on whether someone pays attention to you and ultimately joins your team, or becomes a customer. This might be a game of numbers, but it is also a game of skill and strategy. You need to practice your elevator speech, know how to answer questions, and overcome objections. Help your team members with their calls. Listen in to what they are saying so you can give them honest and constructive feedback. Let them listen to some of your calls and provide some coaching to them after each call to help them improve. Never alienate someone because they say no to becoming a customer or distributor. Treat everyone with respect. If you treat people wrong they will never work with you. If you treat people well, there is a good chance they will come back to you when the timing is right for them. If you treat people well, they might tell one or two people. And if you treat people badly they will probably tell 100 people. You need a WHY that is so big and powerful that it moves you to action and keeps you in the game. A strong why will keep you in the trenches, even when things are tough and aren’t going your way. If you don’t have a big why, you will quit when things get tough. Every serious network marketer needs to create their own brand. Even if you aren’t building online you need to realize that your prospect will research you online, to see what you are all about. I suggest you promote yourself, in addition to promoting your company. Your brand will be your most valuable asset. Once again, this is a game of strategy and skill, not just a game of numbers. You need a game plan that everyone on your team can follow, so they at least have a fair chance of achieving success. 95% or more of your team will need intense hand holding. Everyone has baggage. Everyone has experiences in their lives that make them who they are. Lots of people have low confidence, worthiness issues, and self-esteem issues. Some people who join your team previously failed in network marketing. You’re going to have to get the root cause of each person’s problems and help them overcome their own issues, so they can be successful. Nobody joined network marketing because they want another boss or another job. People want more friends. You need to treat people well, regardless of their performance. Meet people where they are at and never pressure them or force them to do more than they are willing to do. Follow the Golden Rule. Treat everyone as well as you would treat your own mother or daughter. Be nice to people. See the best in people. Recognize people for their efforts and make them feel proud to be part of your team. Stop puking your business and products all over your Facebook wall. Stop spamming people on Facebook. Never mention the name of your business on Facebook, on your timeline or in your profile. It’s fine to meet prospects on Facebook, but use the phone, email or face to face to communicate with them to share your products or business opportunity. Wes Linden is a top producer in his network marketing company. He has spent more than 17 years in the same company. He is the author of the best-selling book “79 Network Marketing Tips for Fast Track Success.” You can visit his website to learn more about him. In review, these are some of my favorite lessons from Wes Linden’s speeches at the 2015 MLM Mastermind Event in Orlando, Florida. Which one is your favorite and why? Leave a comment below to let me know what you think. I look forward to hearing from you. Next Next post: The Perfect MLM Prospect: Who Are They? Many people probably wonder why Wes mentions that many people join the business with baggage. We need to understand this because when we assume that they can do and be anywhere at certain times or for certain things, we need to realize these people have lives aside from the network marketing business too. I have been guilty of just thinking that a person can drop something because I have something in store and they say no, and we wonder why…they have other duties and responsibilities too. They also have baggage that can affect their network marketing business, and we need to always keep that in mind and not take it personal. It happens. We all do have baggage. It’s our ability to help others overcome their baggage, and overcome our own, that really matters. These are some great lessons from Wes Linden you shared. #1, I have done it and I know many others have too. It seems like our presentation is going well and all of a sudden, everything changes. When we look back, we realize that we said something that did not sit well with the prospect. Sometimes it is better to not open our mouths so much and listen. We also need to think before we speak. Also #8 is so true. We cannot act as if we are dictators. We need to inspire and motivate and not always be in a criticizing mode. Thank you for sharing these Chuck. This is a volunteer Army. We have to lead by example and inspire others. I love point #4 about having a why that makes you cry. It kind of seems extreme, but I think the idea of having a motivation that is so strong it can bring you to tears is completely reasonable. If your why isn’t that intense then it likely won’t be enough to keep you involved and working when things get tough or business gets slow. I thought of my ‘why’ when I read that point and I did get a bit teary eyed, so there is definitely something to the idea. You definitely need a why that makes you cry if you want to make it big. 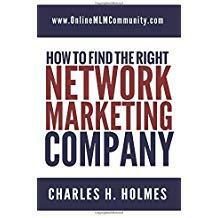 Some great advice on marketing and networking. A very positive spin to it.